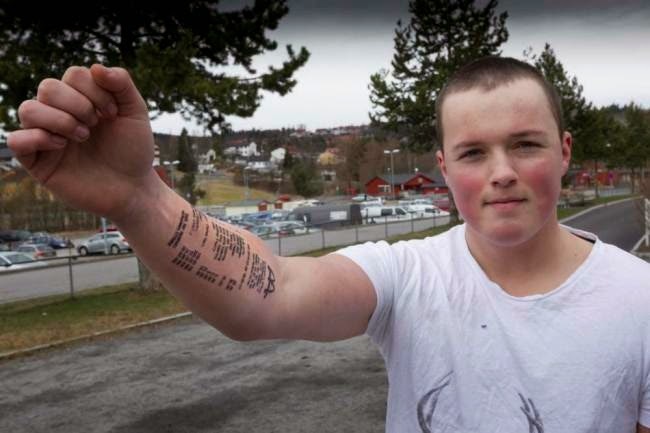 This post is inspired by the recent events of the Norwegian boy who got a tattoo of McDonald's receipt. This tattoo is a just receipt from McDonald's - some fries and mcflurry etc. But what's interesting is the fact how fast it got so popular and many people asking WHY? Why he got this weird tattoo which is forever, why would he do it. Why do people hate tattoos? Why people are like "your tattoo has to have a deeper meaning!" Why is that so? I found many "stories" behind this tattooed young man. Someone found out that at least it has a deep meaning because it's a receipt from the last meal he had with his deceased mother at McDonald's, so everyone just calmed down. How pathetic. I don't get why people tend to hate other's people permanent decisions. Do people with tattoos offend people without tattoos that "Hey man, I don't get why you don't have any tattoos, your life is pointless!" Do they? No. I think it's similar with religion. Christian people try to turn you to God, to be a believer and that's all okay because it is like God pleases, but when a non-believer, an atheist tries so say that there is no God, it's not okay, and so on and so on. So why a tattoo has to have a deeper meaning? Why? I get when a person gets a tattoo as a picture of his family or a pet, but why do a fun, spontaneous tattoo, has to be very serious. Just because is forever? And? It's his body not yours, who gives you a power to judge other's people life decisions? I admit, some part of my life I wasn't very different from these "tattoo-judging-types" because I found that very rough and rebellious and that wasn't me. But as soon as I got a little tiny tattoo with 3 words I was like that was fun, that was adrenaline, I want more. Sure, people should reconsider what they're getting if they want a serious job where they don't like tattoos etc, but it doesn't mean it can't be fun. I saw many worse tattoos that this one, and actually I like this one. I was at lunch with my co-workers the other day, and one of them has a tattoo, some samurai on his hand. All people at the table started "why did you get this, what does it symbolizes" and I was like "Why man? Why it has to symbolize something. He just liked it at the time. Maybe he won't like it in a long-term but that's something he has to live with, NOT YOU! And people with tattoos don't see it like a special event, they see it like an amazing art they can carry around forever. And tattoo artists are artists like Picasso or Monet or whoever. For them is a human body just a plain canvas where they can express themselves." It's their decisions and asking "why did you get it" it's awful and doesn't change a thing about their love to tattoos. It's just irritating, so..please stop.